We have become more involved in outdoor recreational activities, especially hiking. We have a lot of trails and paths in our neighborhoods interconnecting them. Bikers and hikers use them a lot. Our local parks offer many more challenging trails for off-road bike enthusiasts. 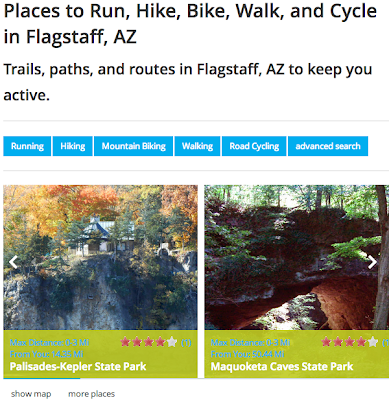 We make a point of looking up the trail systems in our state parks when we go somewhere. Nothing beats having input from people who have actually been there and can offer insight to the quality of activity the trails offer. We want to help people be active no matter where they are. 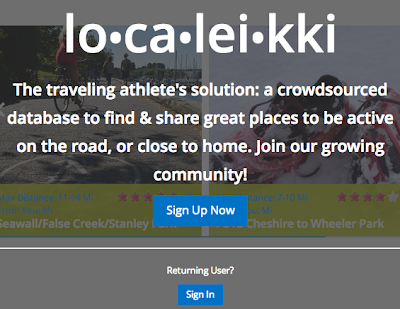 localeikki is a database of recreation locations that are publicly accessible and locally recommended. Input an address & your activity choice and localeikki will find local running/cycling locations others have shared. Not only will you know where to go, you’ll also know what it looks like & what amenities are available (e.g., bathrooms, drinking water, parking). Want to find a regularly scheduled ride or run? We have that information too! You can find us on the web and as an app for your mobile devices. It is simple to use. Open the app. It finds your location. Click on the kind of activity you want. It shows them, what they offer, and how far they are from you. The content of their database of places is crowdsourced. You can add your own places to the database with their easy form. If you are an outdoors person, take a look at this app. It is a good tool for your next activities. Here are two screen shots. In the interest of full disclosure, a co-founder of this app is married to our niece. This entry was posted in Outdoors and tagged Bicycling, Crowdsource, Hiking, Outdoor recreation, Play, Recreation, Running, state park, Trail, Walking on December 29, 2013 by Jim R.
I think it is. They are just starting to get it off the ground. This looks cool! I’ll have to check it out! Haven’t heard much lately from your part of the world. I hope you’ve been having a good holiday season. It sounds like a very useful app.My husband and I enjoy biking and are always looking for good trails.